Ardis, here, stepping in while Kath helps our author put the finishing touches on our next book. Crewel and Unusual will be out January 1, 2019. Can you believe that? Less than six months. Lord love a duck. In the meantime, it's hot, they're madly typing, and I'm here to offer an old stand by so everyone keeps their cool. This lemonade is gorgeous and absolutely delicious! We enjoyed it in Last Wool and Testament, the first book in Haunted Yarn Shop series. You'll find the recipe there, too, (along with a fantastic cake recipe). You'll find recipes in each of the books, as well as craft patterns. I’ve tried two methods for making the lemonade and have come to prefer the second. I’ll include both, though. The first uses a regular blender. The second uses an immersion blender and a soup kettle. 1. Bring the water and sugar to a boil in a small saucepan over high heat. Stir in the rosemary and set aside to steep for 1 hour. 2. Strain the rosemary syrup into a blender. Add a third of the lemon juice and a third of the watermelon. Cover, and puree until smooth. Pour into a pitcher. 3. Puree another third of the lemon juice and watermelon. 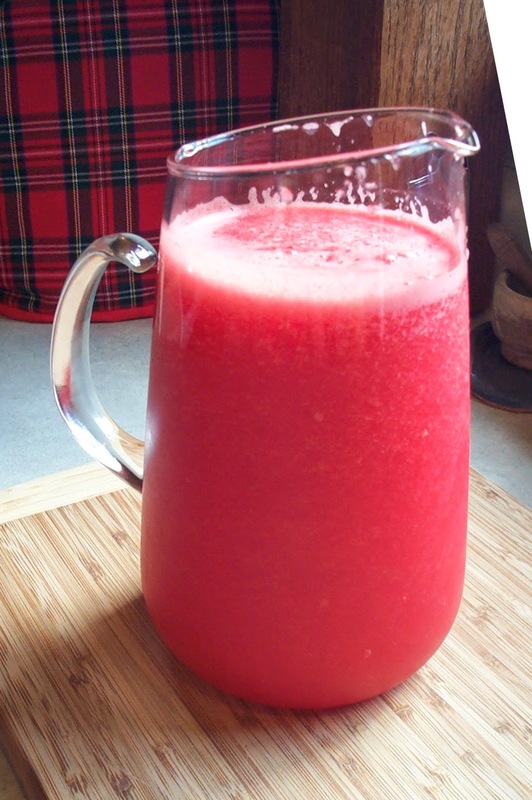 Add to the pitcher and repeat with the last of the lemon juice and watermelon. 4. Stir the lemonade before serving. Hold your glass to the light and marvel at the beautiful color. 2. Strain the rosemary syrup into a soup kettle big enough to hold all the ingredients. Add the lemon juice and the watermelon. Blend with the immersion blender until smooth. Pour into a pitcher. 3. Stir the lemonade before serving. Hold your glass to the light and marvel at the beautiful color. Now, sit back, have a sip, read a good book, and enjoy your summer! 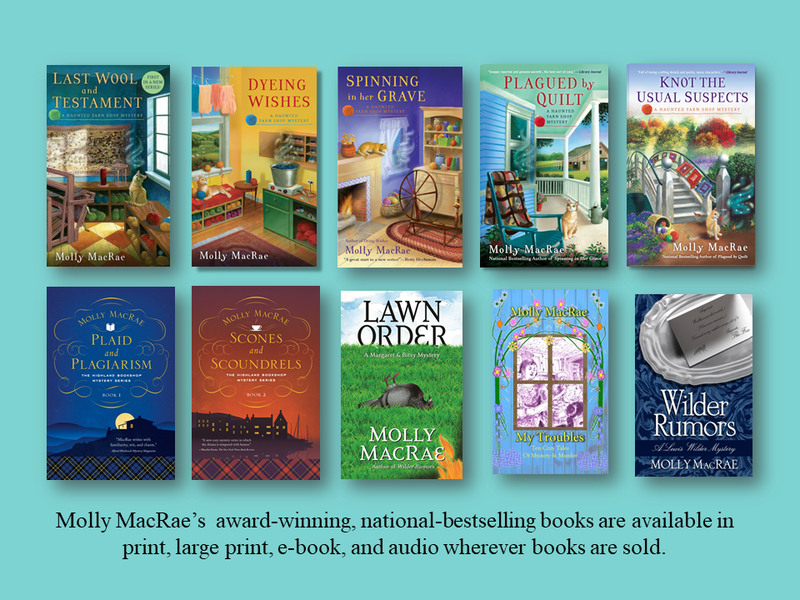 Molly MacRae writes the award-winning, national bestselling Haunted Yarn Shop Mysteries and the Highland Bookshop Mystery series. She lives in Champaign, Illinois, where she’s been connecting children with books at the public library for the past fifteen years. Visit Molly on Facebook and Pinterest, or connect with her on Twitter @mysteryMacRae. The Rosemary Watermelon Lemonade sounds yummy. Love watermelon and love lemonade so I imagine the marriage of both has to be good. Can hardly wait for "Crewel and Unusual". It's great stuff and very refreshing. Glad to hear you're looking forward to the next book. Geneva is tickled to be back! This will be on my next grocery needs list! Goodness, I love watermelon and lemonade! I am so excited about the new book! I love the series! You'll love the lemonade, and I hope you'll love the book, too! Thanks for stopping by, Deb. I love strawberry lemonade, but I've never tried watermelon lemonade. Sounds tasty. Yum to the strawberry lemonade! I could see cranberry lemonade, too, although I've never seen a recipe. Thanks for stopping by! The lemonade sounds easy and yummy!! Thanks for sharing. Looking forward to the next book. Thank you, Eileen! Readers keep us motivated! This sounds like a delicious, refreshing summer drink. Thanks! How odd. I thought I'd left a comment, but I don't see one. Could there be gremlins at work?